Let’s give the ‘drivel’ its due. Films about heroes who harangue and punish the corrupt go back to the time when Guru Dutt turned his back on a hopeless humanity in Pyaasa. Since then corruption has grown epidemic. And so have films on the theme. 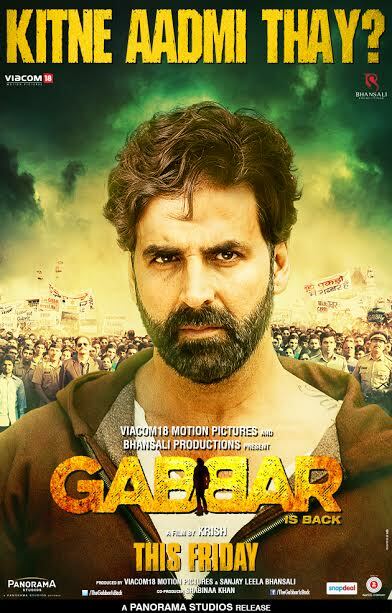 What sets Gabbar is Back apart in the genre is its unabashedly massy tone. Here is a film about a man who decides to take charge of a social order on the brink of anarchy when all the formal faculties fail. He doesn’t believe in reprimanding the corrupt. He believes in punishing them with death. So we have bribe-happy district collectors and other law enforcers hanging limp on trees and hoardings. Yup, this Gabbar means business. 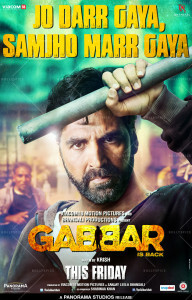 And to the character’s good fortune he is played by the very watchable Akshay Kumar. For my money and time Akshay is by far the most complete star-actor package among contemporary A-lister heroes in Bollywood. The way in which he delivers his lines on the rampancy of corruption, his demeanour and his wry detached disdain for the corrupt are all brought to the surface with a forceful equilibrium constantly at play. This is a star-actor at the pinnacle of his power. Akshay Kumar exudes the kind of understated confidence while delivering lines about a corrupt-free nation, that requires a lot of sang-froid , inner conviction and most important of all, an audience that would believe in the hero’s convictions. With due respects, none of the other A-lister superstars of Bollywood have the power to sway the masses with idealistic rhetoric. It’s in his eyes. Akshay makes you sit up and listen without raising his voice. To his good fortune, in Gabbar he gets lines about a Swach Bharat that are compelling rather than corny. The lines flow with furious passion without getting swamped in bombast. That’s a near-miraculous achievement in a film which is designed as a high-octane melodrama with every sequence punctuated by elaborate background acoustics (Sandeep Chowta). Rajat Arora’s dialogues are Akshay Kumar’s biggest support system here. Director Krish, known down South for fashioning flamboyant fables, here exercises unexpected restraint when one least expects it. This is where this film about a self-appointed anti-corruption vigilante scores. It taps Akshay Kumar’s spiritual energy harnesses it at key points of the narrative to underscore rather than over-punctuate the theme of corruption. By the time Akshay’s Man Of The Masses gets to the climax on top of a car to deliver a rousing speech on youth power the narrative is perfectly attuned to its leading man’s monkish equilibrium and how it can be projected outwards to convey the angst of a wounded ravaged civilization. Even when the arch-villain, an unscrupulous builder played with operatic gusto by Suman Talwar is busy hamming it up to the hilt, Akshay maintains his attitude of detached contempt. Thank God for Akshay Kumar. The screenplay would otherwise have been more of scream-play. The characters and the twists and turns in the lot constantly scream for attention. The exception besides Akshay, is Sunil Grover. Known as the drag-queen Gutthi on Kapil Sharma’s comedy show, Sunil playing a low-rank police constable in a police station filled with officers who are more bothered with the chutney for their plates of samosa than the collapse of the law and order and situation, epitomizes India’s smothered voice of the conscience. It’s such sudden spurts of sensitivity that redeem what would otherwise have been just another loud boorish and garish film about corruption in high-rise places. Builders are the baddies here, you see. Jaideep Ahlawat usually so riveting on screen here seems uncomfortable in his suited avatar as a CBI officer. His belated entry should have done to the narrative what Nawazuddin Siddiqui did to Kahaani. No such luck. The villains are all clumsy cardboard cut-outs conveying the corrupt element with as much subtlety as an uncovered sewage. The women are sketchily portrayed. Shruti Haasan bustles in and out playing a lawyer who is busy delivering homilies and babies on the streets rather than fighting cases. Chitrangda pops up to do an awful item song, best left edited out. And Kareena Kapoor Khan, looking like a zillion bucks (so what’s new) sings a romantic song with Akshay and perishes in a clumsily staged building collapse. Luckily the film survives to tell a tale that’s as relevant today as it was when Kamal Haasan, all dressed up in wizened prosthetics blew the lid off governmental corruption in Hindustani. 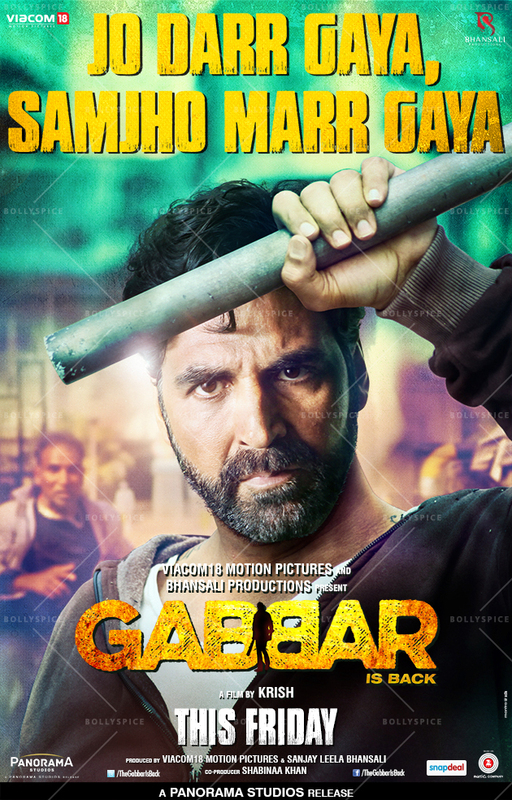 Gabbar Is Back knocks the bottom off the action genre with a breathless ode to Swach Bharat. The film may appear louder-than-life to the dainty-hearted. But the tone is unapologetic massy. You can’t change the disintegrating social order by being subtle. Miraculously Akshay Kumar does exactly that. Don’t ask how. Just go for his bearded, brooding leadership qualities. Swach Bharat needs such a hero. 16 queries in 0.351 seconds.